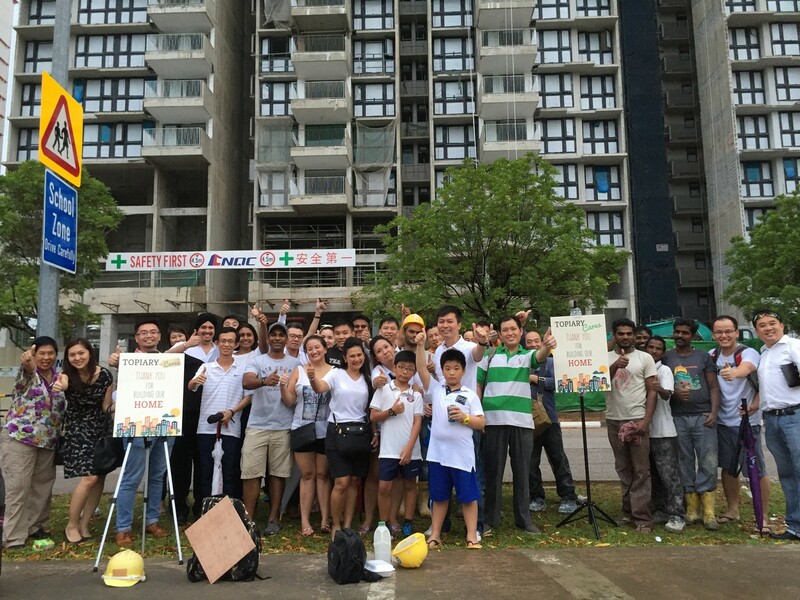 Future residents of The Topiary executive condominium in Fernvale Lane in a group photograph with the construction workers, after distributing snacks and drinks to them as a gesture of appreciation. 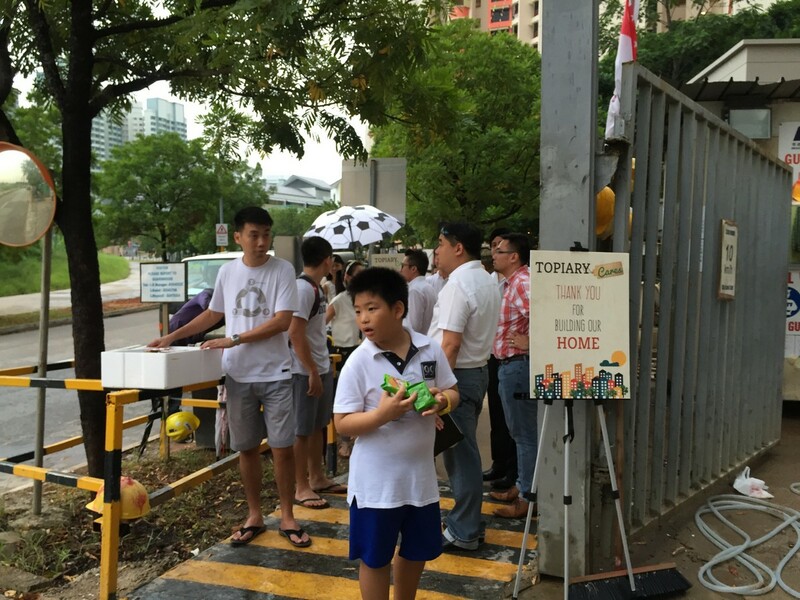 SINGAPORE - The light drizzle did not deter young Venetton Tang's resolve from accompanying his mother to the construction site of his future home. 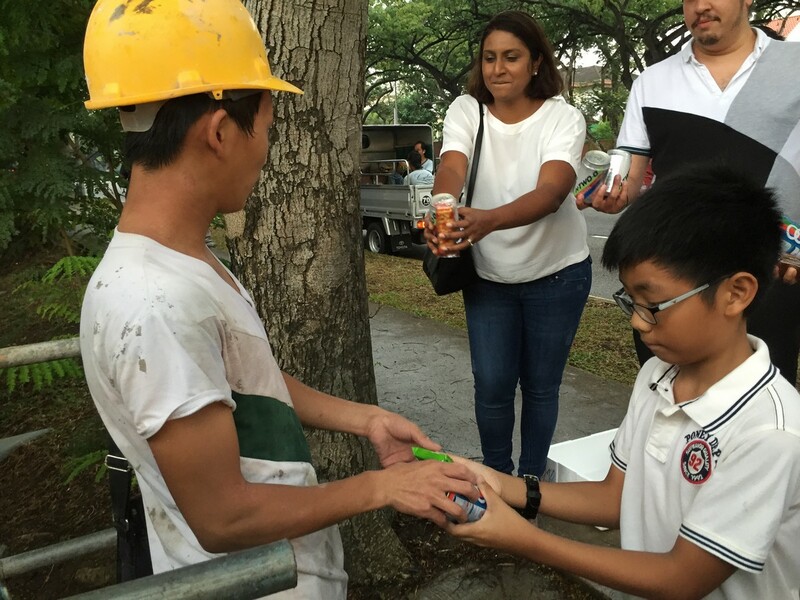 The 12-year-old, who will move into a third-storey unit at The Topiary executive condominium (EC) in Fernvale Lane at Sengkang with his family when it is ready next year, joined a group of about 20 others in distributing tokens of appreciation to workers at the construction site on Friday, July 31. 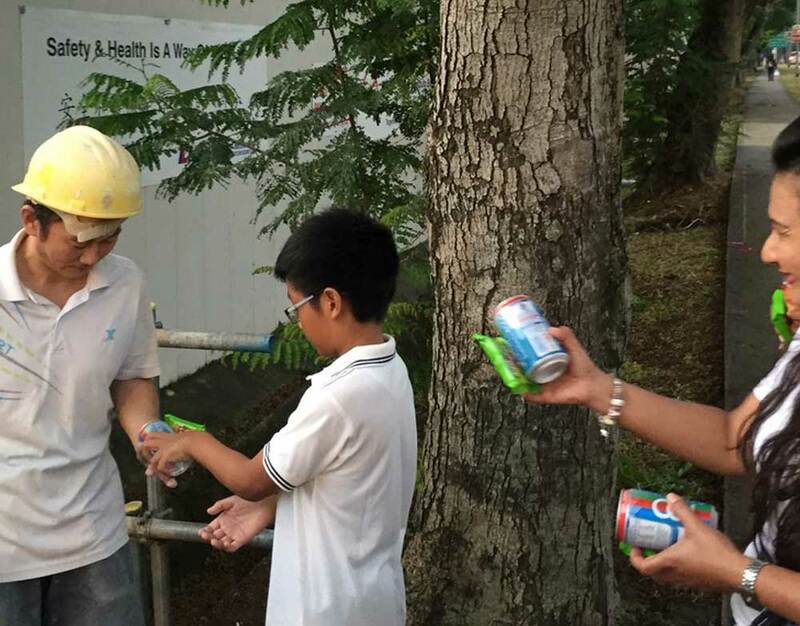 "It is a way to show our appreciation to the workers here as they work so hard every day to build our homes for us," the student told AsiaOne as he enthusiastically passed out packets of biscuits and canned drinks to the workers - who appeared surprised at the unexpected gifts as they exited the site's gates at the end of their shift. 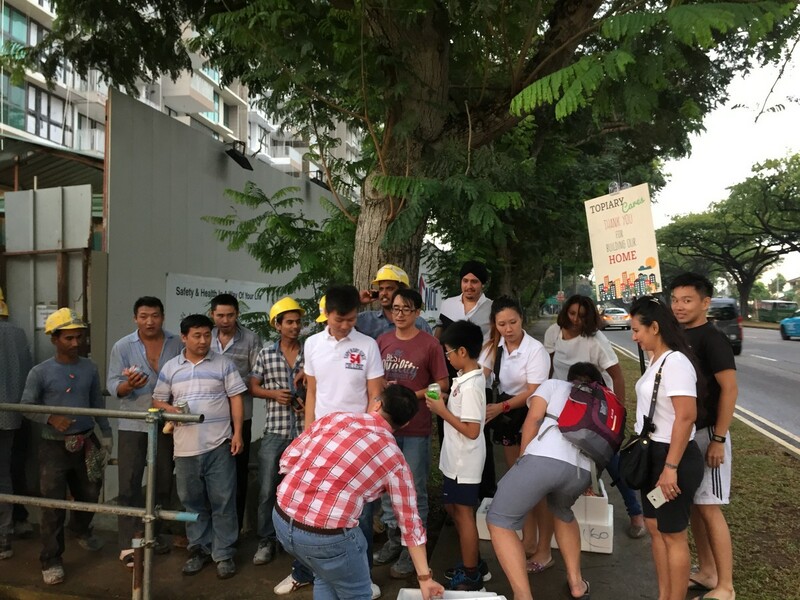 Sales director Mr Alfred Goh, 40, said that the initiative was organised by the 'future' residents as a way to show their gratitude to the workers. Mr Goh explained that the residents had started a Facebook group to get to know each other. Some had expressed concern after the EC project made headlines recently for overcrowding in its workers' quarters. Shin Min Daily News reported that the quarters housed some 200 workers, crammed into 10 makeshift rooms formed with wooden partitions. The quarters had only makeshift toilets, with mosquitoes and rats in the area. A worker from India revealed that, at one point, there were 22 to 25 men in each room. 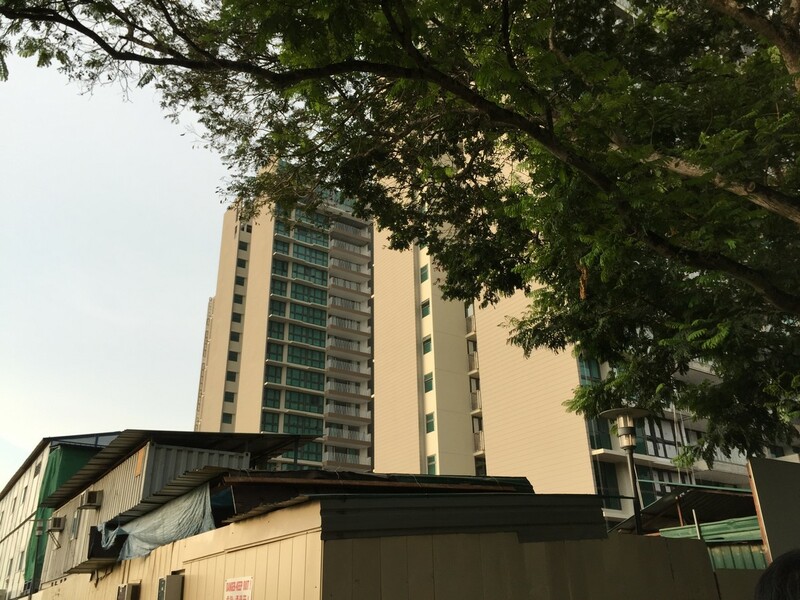 The Ministry of Manpower (MOM) launched an investigation and conducted an inspection of the quarters, located in the basement carpark of an unfinished project in Sengkang. It found that occupancy at the quarters exceeded the capacity limit, The Straits Times reported. "We became concerned after seeing the report in the papers, and that got us thinking about doing something for the workers," said Mr Goh. He explained that one of the residents, Mr See Haojun, decided to start a campaign on online fund-raising website Indiegogo. The campaign, which was launched about two months ago, successfully pooled almost $3,000 from the residents. 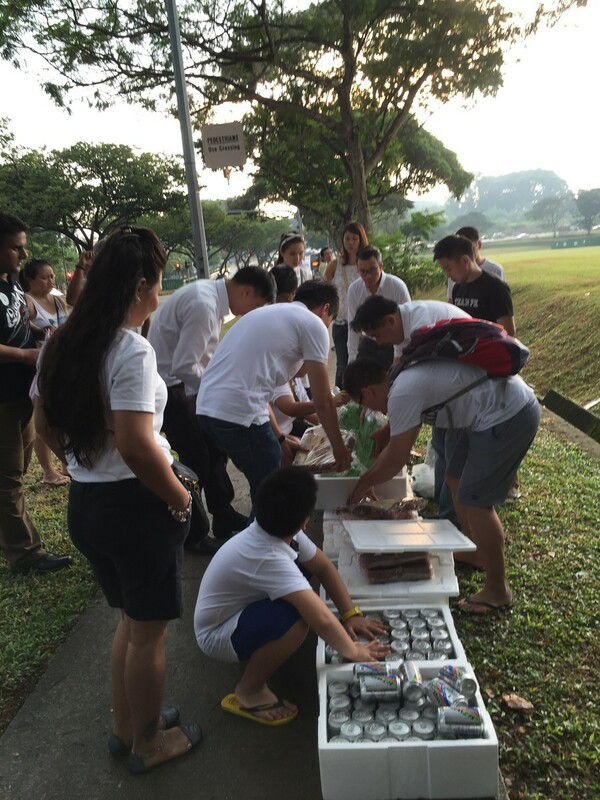 Mr Goh said that a part of the funds had gone into buying the snacks and drinks for the workers. "It is just a small gesture, but we hope it helps boost their morale and shows them that we are grateful to them for building our houses for us." But this is by no means a one-off gesture. 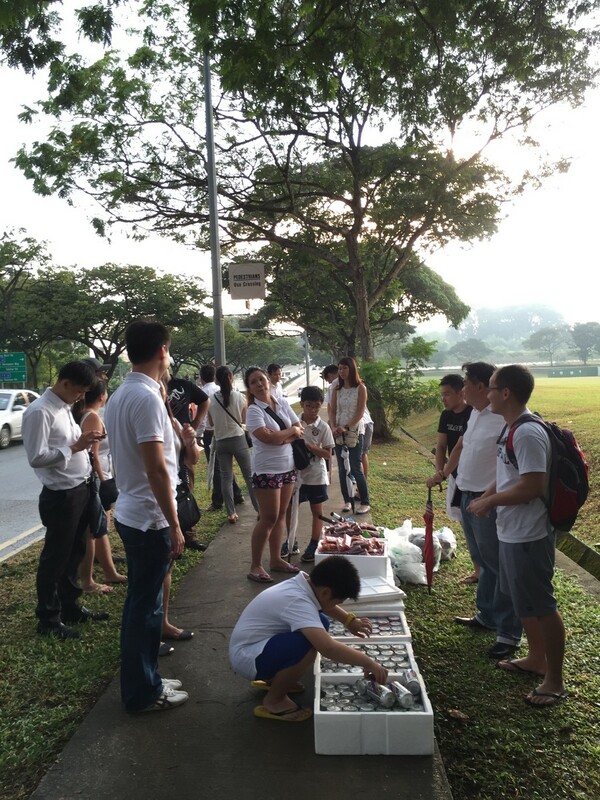 Mr Goh disclosed that the group is planning to channel the rest of the money into organising a larger barbeque event as a proper thank you for the workers, which will be held after the residents receive their Temporary Occupation Permits (TOP) when construction is complete. The distribution of the snacks lasted for about an hour, with each worker getting a packet of biscuits and a canned 100Plus or H2O. When they received their tokens, the workers smiled and politely thanked the residents. Some even asked to take photos - the group were happy to oblige. 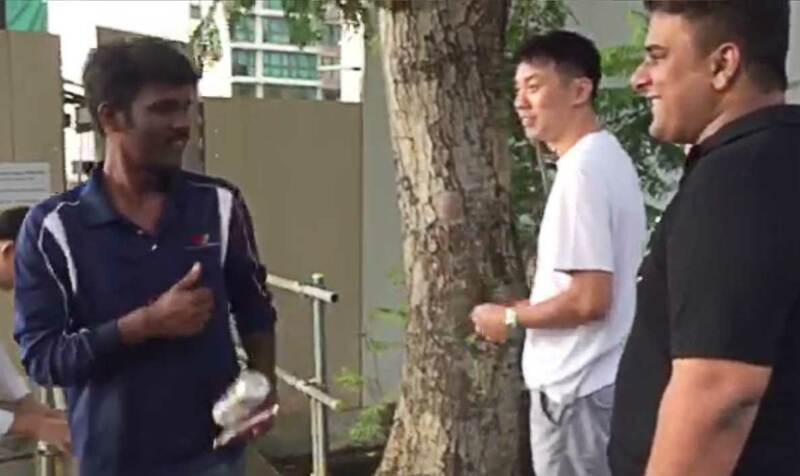 Lawyer Mr Subir Singh, 33, another future resident who was a part of the group, expressed hope that the gesture will help highlight the plight of foreign construction workers in Singapore. "They sweat and toil every day for long hours in quite trying conditions, under the heat of the blazing sun or sometimes even in the rain, but they remain underappreciated by many of us," he said. 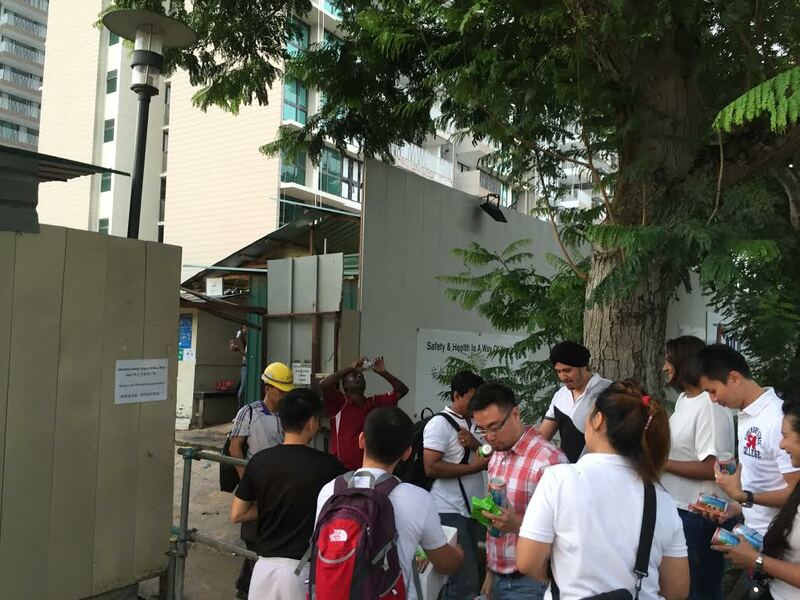 During the distribution, a safety coordinator at the worksite, who identified himself as Mani, was seen ushering the workers to the gates to collect their snacks. "It is very kind of them [the residents]," he remarked. "You can see that the workers really enjoyed the treat and that it has made them very happy." The light drizzle did not deter young Venetton Tang's resolve from accompanying his mother to the construction site of his future home. 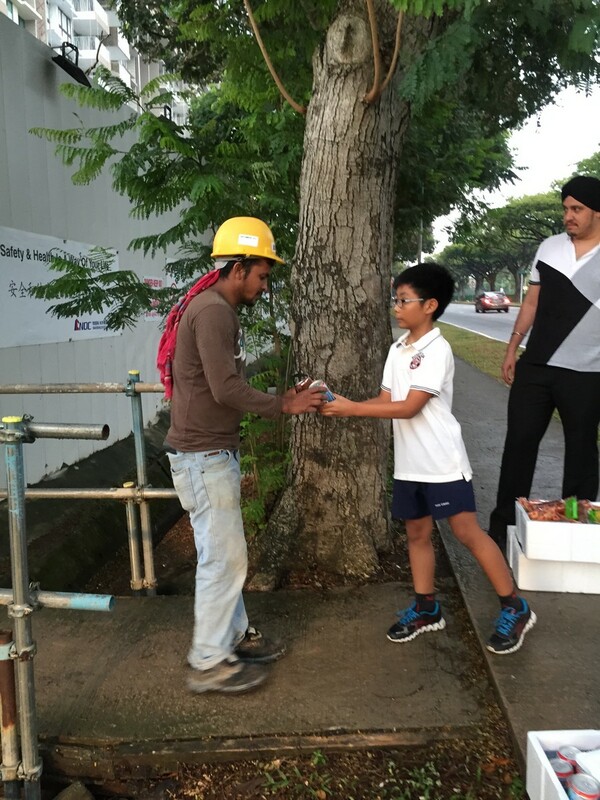 The 12-year-old joined a group of about 20 others in distributing tokens of appreciation to workers at the construction site on Friday, Jul 31. He will move into a third-storey unit at The Topiary executive condominium (EC) in Fernvale Lane with his family when it is ready next year. 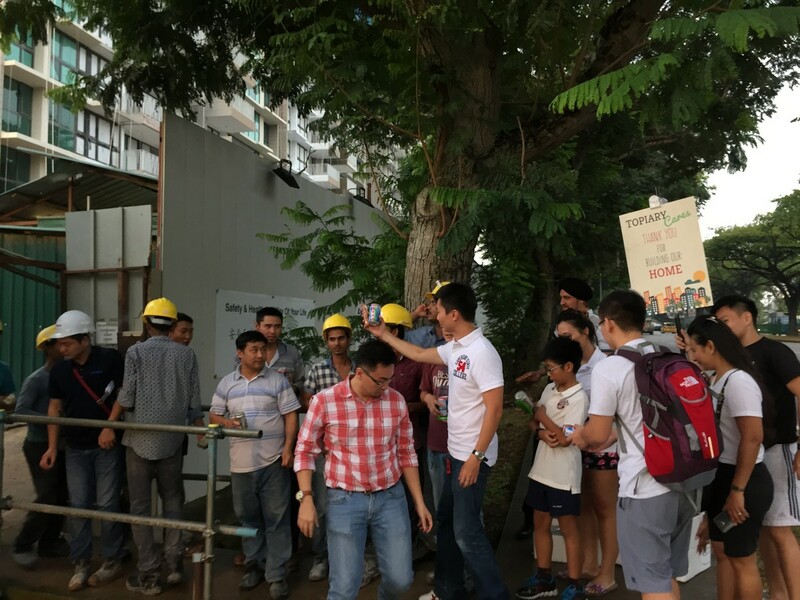 "It is a way to show our appreciation to the workers here as they work so hard every day to build our homes for us," the student told AsiaOne. 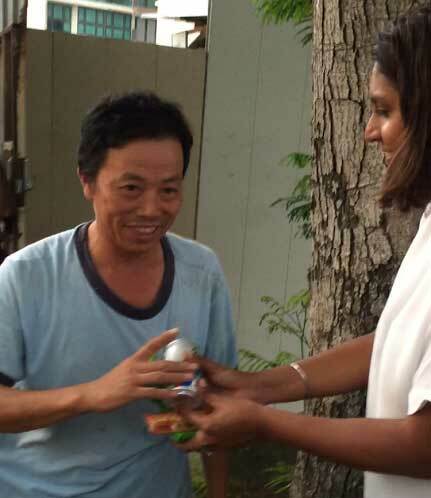 He enthusiastically passed out packets of biscuits and canned drinks to the workers - who appeared surprised at the unexpected gifts as they exited the site's gates at the end of their shift. A worker from India revealed that, at one point, there were 22 to 25 men in each room. A Ministry of Manpower (MOM) investigation found that occupancy at the quarters exceeded the capacity limit. One of the residents decided to start a campaign on online fund-raising website Indiegogo. The campaign, which was launched about two months ago, successfully pooled almost $3,000 from residents. 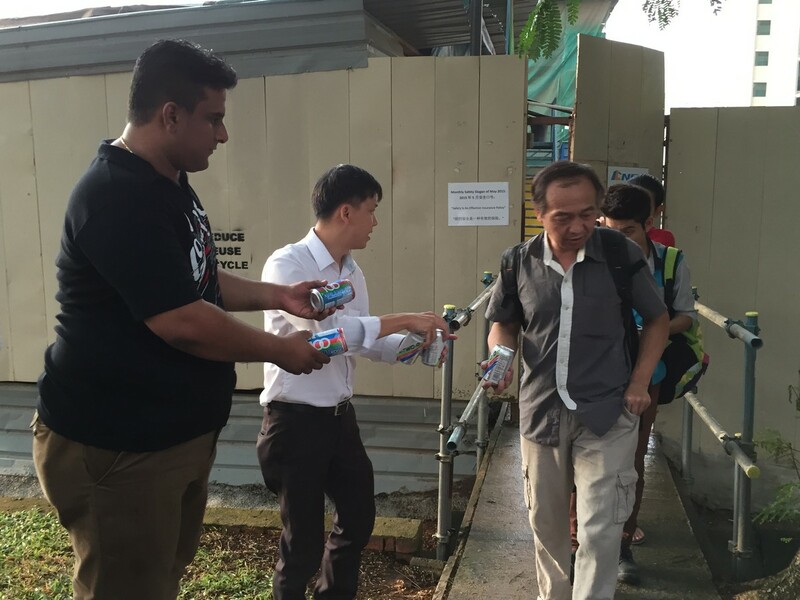 Mr Goh said that a part of the funds had gone into buying the snacks and drinks for the workers. 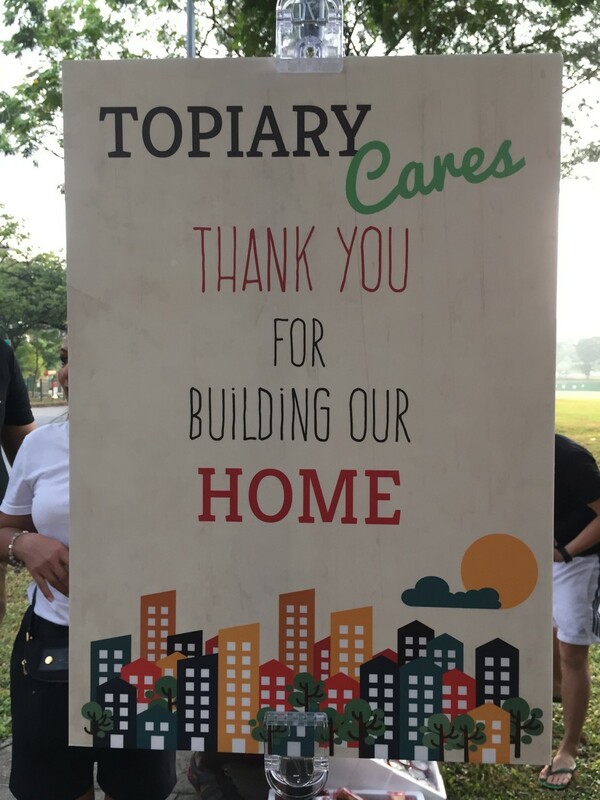 "It is just a small gesture, but we hope it helps boost their morale and shows them that we are grateful for their sweat and toil in building our homes for us." But this is by no means a one-off gesture. Mr Goh disclosed that the rest of the money will be channeled into organising a larger barbeque event as a proper thank you. The event will be held after the residents receive their Temporary Occupation Permits (TOP) when construction is complete. The distribution of the snacks lasted for about an hour, with each worker getting a packet of biscuits and a canned 100Plus or H2O. When they received their tokens, the workers smiled and politely thanked the residents. Some even asked to take photos - the group were happy to oblige. 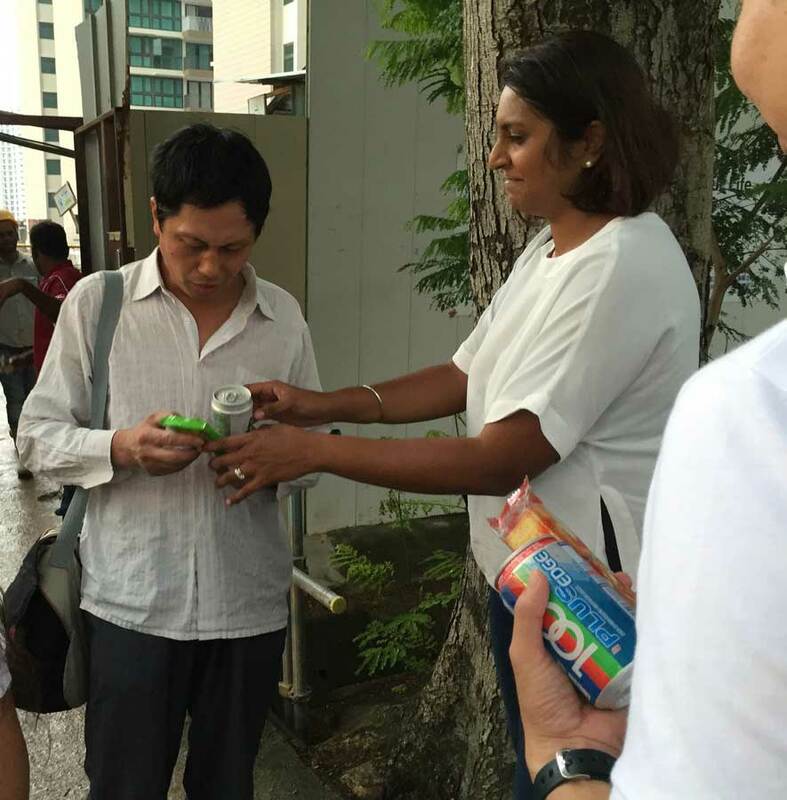 Lawyer Mr Subir Singh, 33, expressed hope that the gesture will help highlight the plight of foreign construction workers in Singapore. 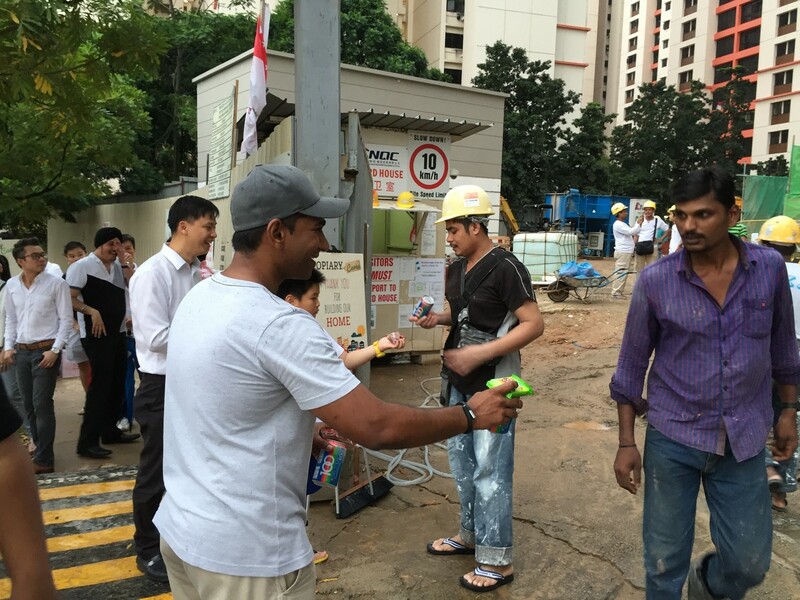 A safety coordinator at the worksite, Mr Mani, remarked: "It is very kind of them [the residents]. You can see that the workers really enjoyed the treat and that it has made them very happy."